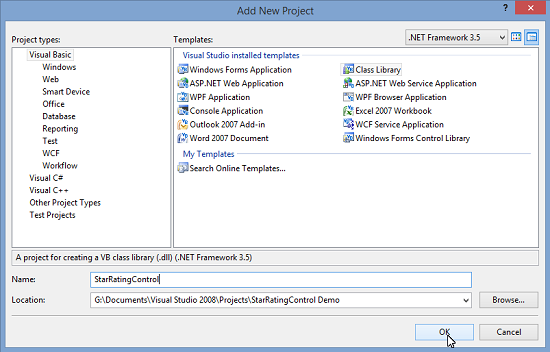 This is a graphical Custom Control that extends the available ToolBox items in VB.Net. Fortunately it is very easy to create, compile, and distribute your own Custom Controls these days. This is a Custom Control that was written as a tutorial for those interested in writing their own Controls. It started out with a standard winforms application (the demo application). From the File menu, choose Add-->New Project, then from the Dialog that appears, choose and name, a Class Library project (which provides you with an empty Class template - Class1). This adds a suitable project to the solution. This project will contain the StarRatingControl. You could also choose a Windows Forms Control Library project (which provides you with an empty UserControl template - UserControl1). In this case the Class Library was utilized, deleting the default Class1, then adding a new UserControl, naming it StarRatingControl. The StarRatingControl is composed of a UserControl, containing five PictureBoxes and one Label. The PictureBoxes contain (at runtime) either a grey star, a gold star, or a part grey, part gold star. This view is when the user moves the mouse over the Control. This view is when the user has clicked one of the UserControl PictureBoxes whilst in live view. In this view the UserControl remains frozen until the user moves the mouse outside of the UserControl. This view is where the stars display a graphical average of all ratings, and the label displays a textual average. This is the view that displays when the user moves the mouse outside of the UserControl. The code is simple, handling the MouseMove and MouseDown events for the PictureBoxes, and the MouseLeave event for the UserControl and all of the contained Controls. This is to facilitate changing the currentView variable to allow using the UserControl as an input Control, and also as a display Control. Label1.Text = "No ratings yet"
Finally, as this is a Control that can be added to your ToolBox in it's compiled state, a 16x16 image was added to the UserControl project, and set as an Embedded Resource. To use the image as the icon shown in the ToolBox, a ToolboxBitmap Attribute was added to the top of the StarRatingControl code.